​We do respectful estate sales and estate liquidations as well as free appraisals. Call us for a no cost consultation to see if we can help your family during this sensitive and stressful time for you and your loved ones. We do full service ESTATE SALES in Grass Valley, Nevada City. Penn Valley. Colfax and Auburn as well as other many other Northern California areas. Call me,Robin Longacre at (530) 913 0449 and we will talk about your particular needs. Robin is a 7th generation Californian and 3rd Generation antiques lover. She has a background in Art History and has been doing appraisals for many years. Her husband works along with her on the weekends. Robin and Steve have 11 grandchildren all living within 3 miles from them. Robin has been doing estate sales for many years and loves her work. cash and get your family property empty and ready for resale. Our experienced team will help organize a professional estate sale for you quickly and efficiently, in most cases within one to two weeks time... start to completion. Longacre Flea Estate Sales will handle all the details of your estate sale from set up and display, advertising and clean out. comes with such an undertaking and would like to put your mind at ease. the home what you decide to keep and worry no more, we will take care of the rest. If you’d like, we will even have the house professionally cleaned when we are done. With a background in Art History and being an appraiser for many years you special items are in good hands. We will evaluate and assess your items based on the value of today’s market and price them to achieve the highest revenue possible for you. We will prepare your home, organize your items, price items and set up necessary tables and stations in order to make your sale successful. We will post signage on roads, ads online and on social networks, place ads in your local newspapers, and we are Gold Members on estatesales.net which gives us nationwide coverage of all our sales. We also have a 1,200 people strong email list of loyal customers in Northern California. We do not publish your address until the day before the sale, just street and city. ​We would love to help. The Longacre Flea is an estate sales company and antique and vintage store and online shop . Sometimes our clients have items that are too valuable to sell at their estate sale or they do not have enough to warrant a full sale in their home so I offer my services to consign their items to my specialty antique online shops. There is a greater chance of their items selling to an online international market and the split is the same as if they were going to hire our company to do their estate sale. 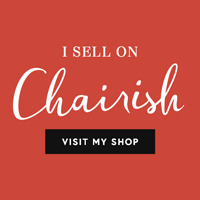 I Also Sell On Chairish. See my trending furniture and home decor with this pink button.